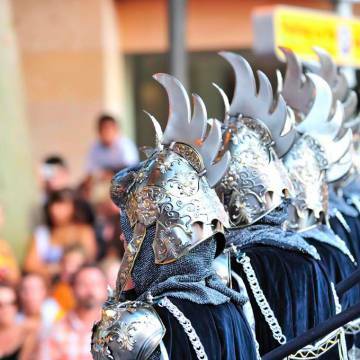 The streets of Dénia are crowded with moors and christians in mid-august. Embassies, street bands, and the lifting of the flag, etc. 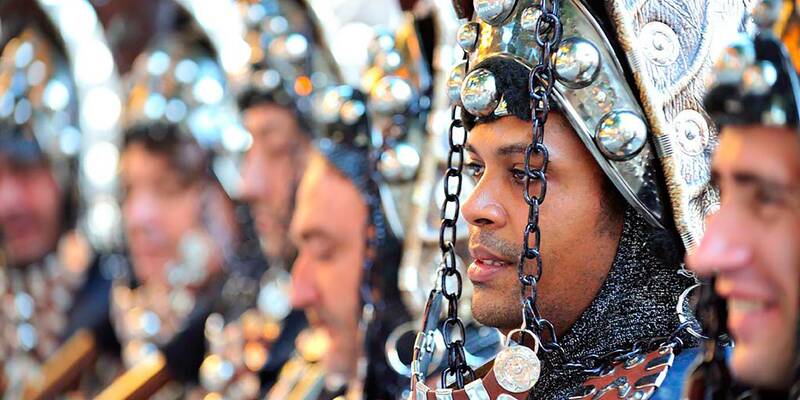 The programme mainly consists in the disembarkation and the Gala Parade where Moors and Christians wear their luxurious costumes while the music is playing. In addition to it, the festival honours Sant Roc, Patron Saint of Dénia. Traditionally the fiestas include a mass service, the distribution of blessed bread, a dinner of brotherhood and a procession. The honors are organized by the Cofradía de Sant Roc. 13th August: Disembarkation of moors, truce signature. 14th August: Children's Gala Parade. 15th August, day of the Fiesta: Gala Parade. 16th August: Parlaments, Battle of the Arquebusiers, the miracle of the fog, Surrending and Retreat. Fireworks. Christian bands (Bando cristiano): Hospitalaris, Almogavers, Cavallers, Creuats, Deniers, Marins Corsaris, Mozarabes and Templaris. Moors Bands (Bando Moro): Abencerrajes, Alkamar, Almoravides, Amazihg, Amiries, Berebers-Tuaregs, Saqaliba and Walies.